Preheat oil in a good size pot, until it is 350*. Cut chicken breasts into strips or pieces; whatever you prefer. In a separate dish, whisk together eggs and 1/2 TBS of garlic salt; set aside. In a Ziploc bag, combine flour and 1 1/2 TBS garlic salt (we like the Lawry’s salt). A lot of the garlic salt seasoning cooks out into the oil, so you have to add more salt than you think is necessary. Otherwise, they just taste like flour. lol. Soak chicken in egg mixture until fully coated. Place each piece of chicken into the Ziploc bag with flour mixture, one at a time. Shake bag to coat. Place chicken on a separate plate, until all chicken is fully coated. 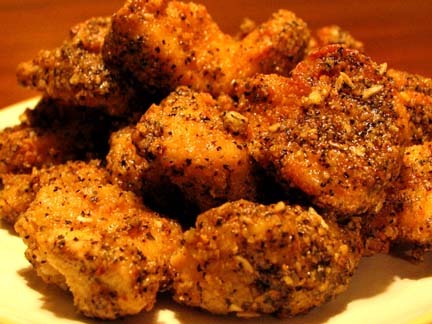 Begin placing chicken pieces into hot oil, one at a time, until approximately 10 pieces are in the oil. Do not over crowd the chicken. You’ll have to cook it in batches. If you’re using a smaller pot, cook less chicken at a time. Cook chicken pieces until golden brown and cooked throughout; approximately 3-5 minutes, depending on the size of pieces. Drain chicken on paper towels. Melt butter in a dish. Add lime pepper seasoning. Place drained chicken pieces in a Ziploc bag. Pour lime pepper butter on top. Shake bag to coat chicken throughout. Place chicken on a plate; it will get soggy quick if you leave it in a bag.